In any armed conflict, there is eventually a point at which one side realizes that it's over. If the people in power don't give up but instead continue to plunge the country into ruin, there is either a revolution from below, as was the case in Germany and Russia near the end of World War I, or there is a coup by the elites, who attempt to save what can still be saved. An example of that is the overthrow of Benito Mussolini in Italy in July 1943. The Germans should have recognized that they could no longer win the war in the summer of 1944. At that point, the war was objectively lost, even if the German public didn't see it that way. But starting in December 1944, after the failed Ardennes offensive, it was also clear to the power elite in the German Reich that there was nothing left to be gained militarily. At that point, it would have made sense to enter into capitulation negotiations. The plot to assassinate Hitler in July 1944 led to a strengthening of the regime, at least temporarily. There was an increase in Hitler's popularity with the public. The shock effect of the attack was enormous. But even more important is the fact that a purge of the officer corps in the Wehrmacht ensued. Arch-loyalists replaced people who were considered unreliable. All resistance was ruled out as a result. Confidence in Hitler hadn't vanished in the summer of 1944. It was only at the end of 1944 that his standing began to fall like a stone. In mid-1944, Hitler's secretary, Martin Bormann, halted the further dissemination of the central summaries of reports from the Reich, arguing that they painted the mood in too negative a light. The reports from the propaganda offices, which were sent to Joseph Goebbels, also reveal this decline in the general mood. Hitler always had a very sensitive ear for anything that could undermine the morale of the German people. He had learned from World War I that it was important to keep the people in good spirits. The normality of routine, even if it's only a phony normality, is probably essential to the functioning of human order. You go to your workplace to check your files, even if the work you do is completely useless. And when your office no longer exists, because it was bombed, you simply set yourself up somewhere else. The exemplary bureaucracy was the backbone of the regime. There was something typically German about it. I'm thinking of a cultural tradition that is imparted through education and encourages certain virtues. Of course, it's actually a very positive thing to have a sense or duty or even honor. But the Nazis completely distorted these values. Albert Speer remains an enigma to me to this day. Without his ability to maintain arms production under the most adverse circumstances, the war would have ended much earlier. In the last year of World War II, as many people died in Europe as on all military fronts throughout all of World War I. The past two years have seen a flood of major works on Nazi Germany. The Final Solution is at the heart of all these books. They make clear that just as the Final Solution itself is now understood to inform many aspects of Nazi Germany, so too the Germans' knowledge of the murder of the Jews influenced and altered the history of the Third Reich and the war it started. The Final Solution was too vast to be kept secret. But the Final Solution reached its height just as Germany's military fortunes began to ebb. Severe wartime privations, ever-mounting death tolls, growing anxiety about the fate of loved ones on the Eastern Front, the disintegration of everyday life caused by Allied bombing — all crimped human empathy, to say nothing of collective action. Although knowledge of the Final Solution prompted action by only a heroic few, that knowledge nevertheless loomed large in the mind of the nation. This was deliberate on the part of the regime. In their public pronouncements Hitler, Goebbels, and Alfred Rosenberg married the bluntest language about an exterminationist policy toward the Jews with a complete absence of detail regarding implementation of that policy. The crime revealed and concealed by that open secret became for many Germans the central psychological fact of the war. For those with the exceedingly rare courage to support an acute and active conscience, the war of extermination was the Third Reich's irredeemable disgrace. It was a crime that demanded the Nazis' overthrow and brought upon Germany a "blood guilt" (the term used almost ritualistically) that could not be expunged. But the letters, diaries, and SS reports on the popular mood reveal that even for the many who possessed a more commonplace sense of their own interest, the Final Solution emerged as their nation's defining act, one that would provoke a terrible retribution. Even if the Jews had started the war and were therefore responsible for their own suffering, so the thinking went, they would nevertheless thirst for revenge, so the Germans didn't dare surrender. By 1943 at the latest, the war was lost for Germany. Yet for nearly two more years the Germans would continue the struggle. 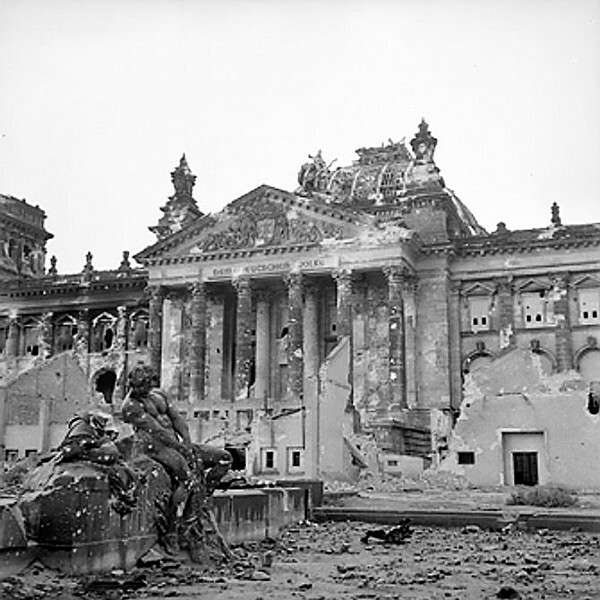 With its fighter force obliterated and its cities naked before the Allies' fire from the sky, Germany saw civilian deaths in air raids increase nearly tenfold in 1945. The army, already bled white in a series of desperate retreats, would suffer more battlefield deaths in the final 10 months of the war than it had in the previous five years combined.